What one of my best girls says to me when we hit the clubs.... "just dance like nobody's watching girl and let yourself free"
send it straight to production. Nice concept but the "Like Nobody's Watching!" could be improved. 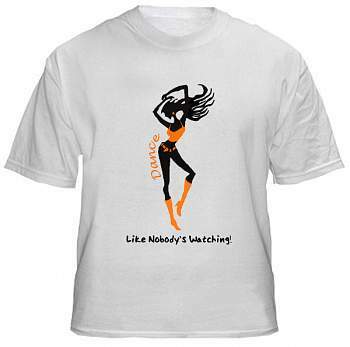 You go girl; I love to dance like nobody's watching; not a shirt a guy would wear but I guess that's the point. I'd wear that in a heartbeat!